Public scanners now available at the American Heritage Center! Public scanners are now available for use in the reading room! The preference by our researchers for electronic copies is increasing; to meet this growing need the American Heritage Center recently expanded its duplication options to include self-serve onsite scanning available from machines in the reading room. Features on the scanner include the choice of color or black and white; different file formats (for example, PDF or JPEG); and the ability to scan to email or a jump drive. Self-provided digital cameras are also allowed in the reading room. Scanning and/or using a digital camera also have the benefit of being free of charge! 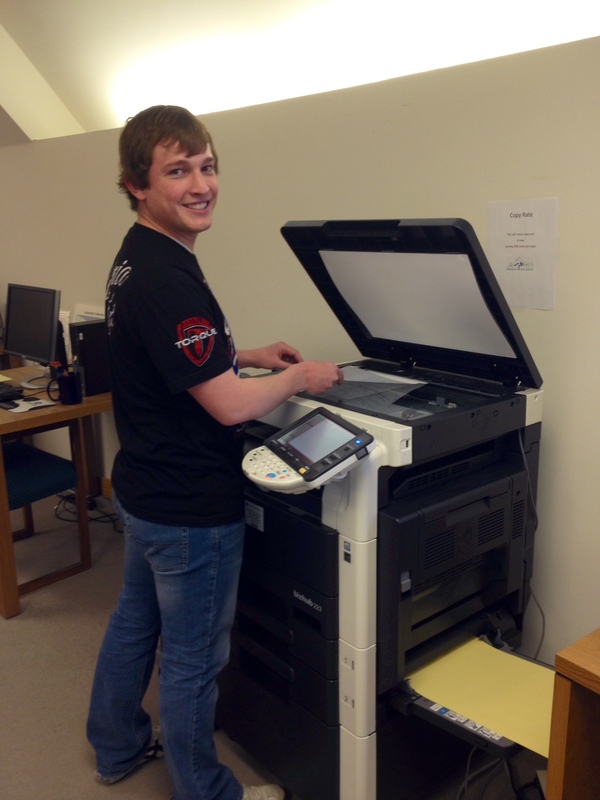 UW student using scanner in the American Heritage Center reading room. Photograph by AHC faculty. If you still prefer a paper photocopy this is still an option, at a newly reduced rate of 20-cents per page. We look forward to seeing you in the reading room! This entry was posted in announcements and tagged announcements, scanning. Bookmark the permalink. 1 Response to Public scanners now available at the American Heritage Center!